The clock tower, displaying the owner's name. This was built in stages between 1888 and 1907 by Ernest Jardine. 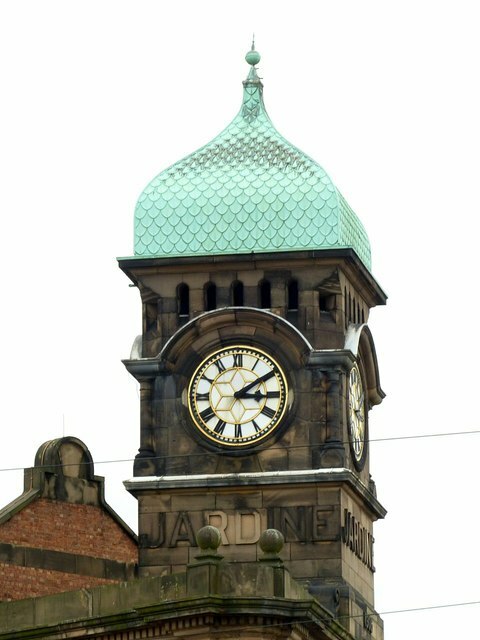 Jardine was a manufacturer of lace making machines, and ran the mill as a 'tenement mill'. Jardine rented space and machines to small scale entrepreneurs, often running just a single machine. The mill is long and narrow, the layout ensuring that good levels of daylight were available at all locations in the mill. A feature of the construction of the mill is the provision of several cross walls rising above the roof line dividing the building into cells that would hinder the spread of fire. About half way along the mill two such walls can be seen very close together. These would have enclosed the rope race transmitting the power from the steam engine to the line shafting powering the individual machines. The final portion of the mill to be built was the facade on Victoria Road, surmounted by the clock tower with its coppered cupola. The mill is now converted into apartments with very little alteration to the exterior of the building. The main loss is the removal of the boiler house and chimney. The mill is Listed Grade II.